Have you ever posted something superb on Facebook and frustrated to see very less of no likes or comments for it? We bet that many of you have. The reason for the failure of that post is that you were not following the best practices described by Facebook. Facebook understands the fact that it is digital publishers, celebrities, and brands which make their social network a better place. So, to help them reach more audience and driving more traffic to their blog or website, Facebook Media has been launched. Facebook Media will showcase the latest trends and how public figures and brands are connecting with their fans. After creating a Facebook fan page, you should do the following for increasing the exposure of your content. Here are some of the best practices put forth by Facebook Media. Share interesting and entertaining content including photos and videos on your page regularly. You should also respond to your fans by replying to their post personally, or by using Facebook Mentions app if you are celebrity. For e.g. : Pop Singer Shakira, uploaded a thank-you video after becoming the first person to have 100 millions Facebook fans. Always share genuine authentic and quality content with your fans. Post statuses, links, photos, and videos on your page many times a day for maximizing the exposure that your content gets. Host a live Q&A session on your page and interact with your biggest fans. You can also embed your Instagram and Facebook posts on your website to get even more exposure. Facebook Insights helps you determine which content works best for which kind of audience. It might happen that you have a young audience and you are posting content tailored for the elderly. In this case, your content will obviously not get the exposure that it deserves. 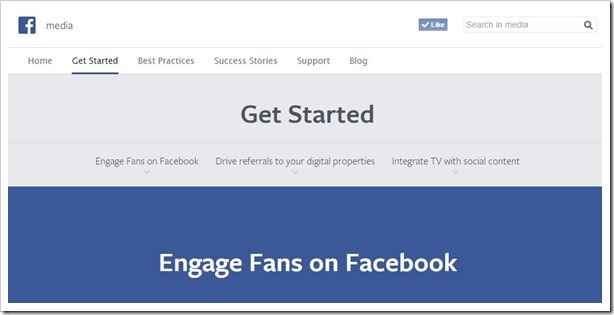 Facebook Media also lets you integrate your live TV session with the real-time activities on your fan page. It offers the APIs for public feed, trends, topic insights, hashtag counter, topic feed, and Instagram. These API lets you connect with your audience in a more intuitive and interactive way. There is no doubt that Facebook Media will be a great help for people who are just starting out and will also serve as an orientation for long time users. Having said that, Facebook Media does not present anything out-of-ordinary that most people don’t know about. While Facebook Media is good to know, we are not sure how it will help veteran users to drive more traffic and engagement to their posts as they are using the same best practices on regular basis. Check out Facebook Media and let us know if it really helps you to increase engagement to your Facebook posts.